Asphalt shingle roofing in Crown Point, IN and nearby areas can withstand any weather condition. When properly installed, it can withstand wind tear off or uplift. It is also fire-resistant. Aside from durability, asphalt shingles require little maintenance, both of which lead to low life cycle costs. Both Illinois and Indiana are rich in architectural styles, and asphalt is a roofing material that can complement any of them. It comes in various colors and can look like wood, cedar, or slate. For added curb appeal, you can choose architectural asphalt shingles. 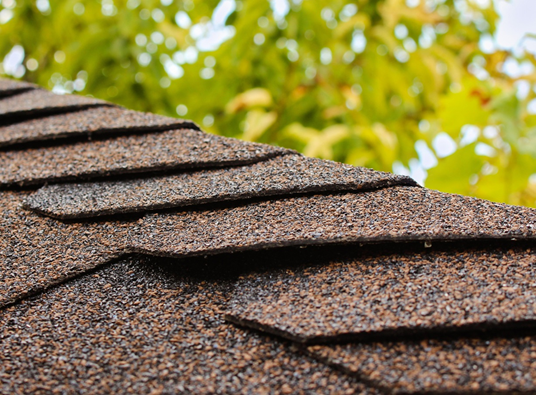 This type of shingle gives a three-dimensional look to your roofing. Compared with other materials on the market, asphalt shingles are the most affordable option. This is a cost-effective solution because you will be saving money on repairs and maintenance due to its durability. You can recycle asphalt shingles when they have reached the end of their service life. Recyclers can mix old shingles with pavement to improve quality. Manufacturers such as CertainTeed also use recycled content when making asphalt shingles, which leads to lesser landfill waste. Asphalt shingles with cool granule technology create a cool roof. Examples of reflective asphalt shingles are CoolStar™, Landmark Solaris™ Collection, and Presidential Solaris from CertainTeed. They are ENERGY STAR–certified and can keep your home comfortable during any season. These features make asphalt shingles the economic choice for your home. To make the most of your investment, choose trusted roofers in Northwest Indiana like Rogers Roofing, Inc. We are a CertainTeed Shingle Master Applicator™ that specializes in repairs and installation of asphalt shingles. With over 40 years of roofing experience, you can be sure of customer satisfaction and quality craftsmanship when you hire us for the job. If you want to learn more about asphalt shingles, contact us today. You can reach us through our contact form.